In terms of overall likeability, it’s a toss-up between Dustin Poirier and Max Holloway — two down to earth fellows who really don’t have any of the negative traits associated with typical a**holery. Holloway brings his son with him everywhere and just slays his audience with fun pidgin speak, usually carrying with him a few cupcakes to hand out. Poirier is like your best friend, fighting the good fight, just trying to make the most of the life he was given. The most common thing said about Poirier is, “Dustin’s a good dude.” That’s gravestone poetry right there. And though it’s embarrassingly cliché to mention, both Holloway and Poirier are warriors in the real sense. As in, they both fight as if adhering to some allegiance to the profound gladiatorial code, a code that I’m not sure actually exists but does, if you know what I mean, kind of like Santa Claus. What they’ve gone through collectively as athletes is unfathomable. A series of in-cage traumas that no human being ever should, and yet each wants more. Each wants to be great. Each wants to be respected. To leave a legacy. Neither one of them seems capable of materialism in the McGregor sense, or super-sulk poutiness in the Rousey sense, or booger-sugar hedonism in the Jones sense. You can imagine either one of them driving an Odyssey, and never getting existential about it. So who do you root for in a situation like this? If Holloway wins on Saturday night, he becomes the UFC’s next two-division champion, which is a hell of an accomplishment for a guy that at one point lost to Dennis Bermudez. It’s not only that Holloway has gotten better through the years and is riding an impossible 13-fight win streak, it’s that he’s everything you could ever hope for in a fighter. Just start with this: He’s willing. All the UFC needs to do is call Holloway, and he jumps on a plane. 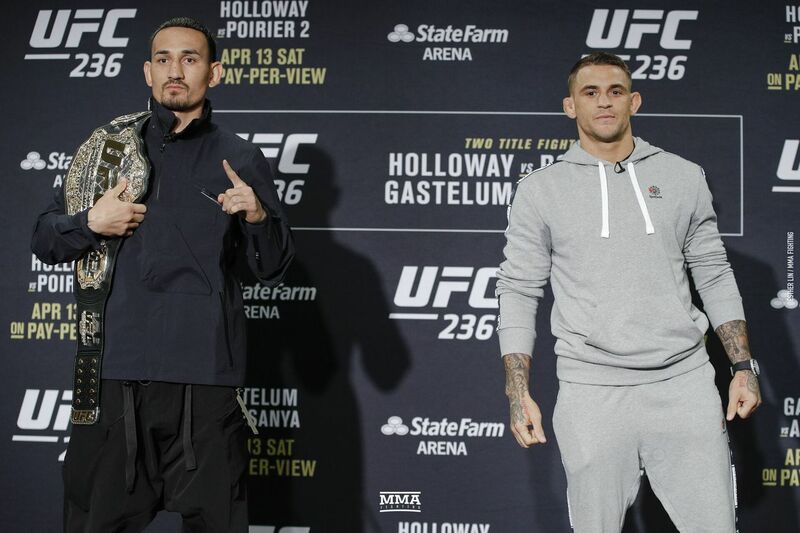 When Tony Ferguson fell out of his UFC 223 fight with Khabib Nurmagomedov, Holloway showed up ready to rock. Was there even one moment of reflection or self-doubt about facing perhaps the most dominant lightweight of all time on a week’s notice? None that could be detected. Even better, he’s a guy who makes pressure situations look easy. Beating Jose Aldo once is a tough enough ask, but to do it again several months later — after he’d been training for Frankie Edgar — was on a whole different level of giving zero effs. Holloway doesn’t hesitate; he gets on with it. What he did to Brian Ortega — after his health scare, which dredged up a whole lot of concern and doubt — made you at least consider the idea that Holloway is operating on a whole different playing field. Poirier’s story is actually the poignant one. He debuted against the highly touted Josh Grispi at UFC 125 eight years ago, and sparked Grispi for three rounds. Since then? It’s been an odyssey. There was a documentary that came out about his life in Louisiana, Fightville, which gave diehards some context about his struggle. It also got hopes up kind of high that he was title-bound. His pattern has been to reel off three or four wins, get into the vicinity of contention, then to lose one. Almost all of his fights are finishes, including the ones he loses. Instead of getting discouraged as another Sisyphean character, he keeps coming back. Like a picture of perseverance. Lose to Cub Swanson? Win three in a row. Lose to Conor McGregor? Win four in a row. Lose to Michael Johnson? Go unbeaten in the next five, and blow up three consecutive champions. Even when he as forced out of his fight with Nate Diaz — a high-profile booking set for Madison Square Garden at UFC 230 — Poirier shrugged it off, and smiled through his pain. Now he’s in the high position he’s been trying to reach for eight years. He’s fighting for the interim title, and the chance to prove he belongs — truly belongs — among the elite of the division. Hard not to appreciate Poirier’s toil and wish him the best. In some ways, Poirier-Holloway is the polar opposite of Nurmagomedov-McGregor. The springtime buzz of this fight is in direct contrast to the dark, brooding mood of that one. Even though they fought seven years ago and there is a history in play, there isn’t any bad blood. There aren’t any iconoclasts in this scenario, no provocateurs, no rabble-rousers. There is just an antsy feeling of a fight between two good dudes to find out who’s better. It’s a fight where you don’t want either fighter to lose, made all the better by each man’s refusal to do so.